Ownership / Access: Brussels Intercommunal Water Company. Open for visitors from April until October. Notes: Château de Modave (French: Château de Modave), also known as the Château des Comtes de Marchin (Château of the Counts of Marchin) is a château near the village of Modave in the province of Liège, Belgium.The oldest part of the building, the donjon, was built on a strategic rock high above the valley of the river Hoyoux. The oldest parts still visible today date probably from the 13th century and were erected by the lords of Modave. 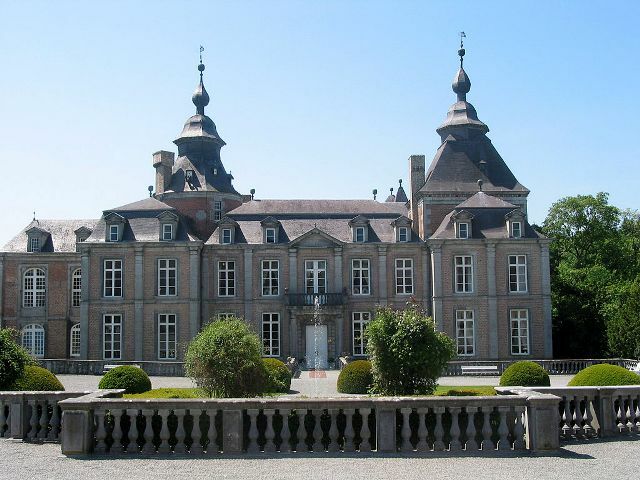 In the 16th century the castle and the estate of Modave became the property of the Haultepenne and de Saint-Fontaine families. In the next century Jean-Gaspard-Ferdinand de Marchin (1601–1673), a great military commander, acquired the castle and turned it from a medieval fortress into a luxury Baroque residence. His son Ferdinand de Marsin neglected the property and lived in France.